I registered because I have a strange problem with Sekiro and ReShade. I'm using a MSI MAG241CR FreeSync Monitor with a GTX 1070 in G-Sync compatibility mode and G-Sync works with with ReShade in Windowed Mode although I get terrible frametimes in windowed mode so I run the game in exclusive fullscreen with Windows 10 Fullscreen Optimizations turned off and there G-Sync only triggers if I remove dxgi.dll and thus remove ReShade. Is there anything else I can try to fix this? Thanks for help in advance! 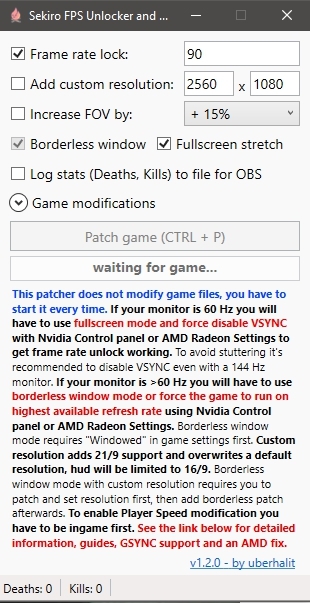 I never had any G-Sync issues due to ReShade and I use the latest, also the most *overlayed* version of Windows (1809-17763), RivaTuner for FPS limiting, but I do disable Steam overlay. Is Steam overlay of utmost importance to you? Hey guys. I had the same issue until i found a perfect solution. Its called Sekiro FPS unlocker. It unlocks the fps so you can choose to go above 60fps, and it adds borderless fullscreen so you can get gsync working again so there is no tearing. Link below. Just click on the "releases" tab and download the latest version. Run it anytime (before or after starting Sekiro). Here are my settings to get Gsync working.